My job provides free meals. This is a beautiful thing. Also, a money saver. Coffee. Soda. Juice. Bagels. Muffins. Salad Bar. Sandwich Makings. Panini Grill. Hot Entrees. When my sister moved to Denver and started her job, she needed to bring a lunch. She looked around my kitchen. Nothing. She took the leftovers of this pasta to work and her co-workers were impressed, "Do you always eat like this?" The answer is no. This pasta was colorful, savory and lots of flavor going on...the veritable party in your mouth. If you aren't a big cilantro or parsley fan, start small. You can always add a little more. If you love lemon, add some additional zest or juice. Boil your water and cook the penne per package instructions. Before you drain the water, reserve two cups of the hot pasta water. Drain your pasta into a strainer. In the same pot, pour in one cup of the pasta water and add the 4 oz of goat cheese. Stir over medium. Add pasta, spinach, parsley, cilantro, lemon zest and juice. This will create the sauce for your pasta. Return the pasta to the pot. If you need/want to, add the second cup of water that you reserved. Season with salt, pepper and/or lemon pepper to taste. 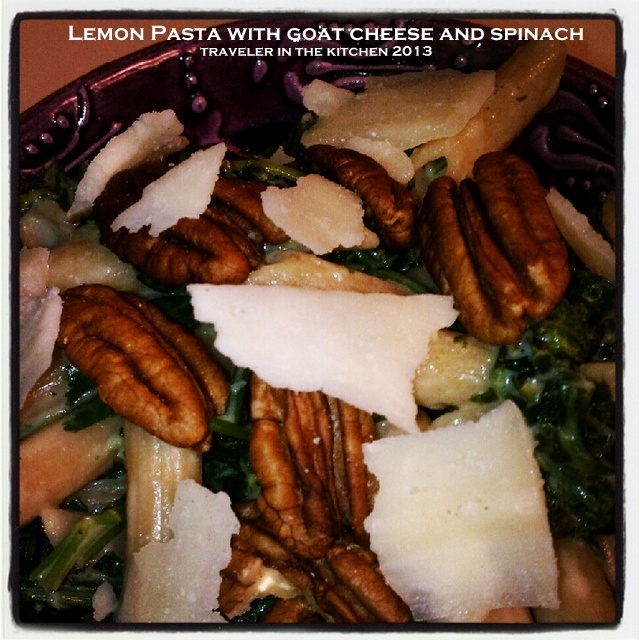 Garnish with pecan halves and shaved Parmesan.